If your android phone is lost or stolen or misplaced, keep calm and take a deep breathe! Because we have an amazing android app that could help you secure your phone from theft, and trace it back or at the least protect your valuable data from being misused. 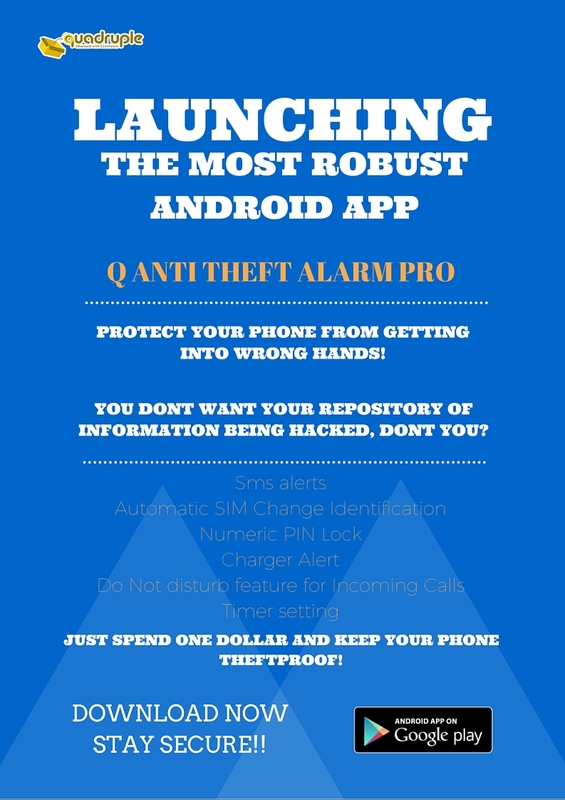 Q-Anti Theft Alarm pro is a brand new app that is designed to fit in high security features in the android market within a single lightweight android app. Just by installing the app could ensure safety to your phone. The app has a default feature that identifies your phone’s current SIM number automatically after the app is installed in the device. This automatic SIM change identification feature is unique and rare. So whenever there is a change in SIM in your device, an alert SMS is sent to your emergency contact. The new SIM might be your phone thief’s, you could even the phone number of your thief with the alert SMS. Amazing isn’t it? Well, there is more to it! The app offers a timer after which the alarm will be triggered in case your phone is moved. You can set your own timer depending on your usage. Set a loud alarm from your gallery and scare away the thief who would have no idea how to stop the alarm from ringing since the alarm can be deactivated only from inside the app. however if the alarm isn’t deactivated within 15 seconds, alert SMS are sent to your emergency contact to notify theft. A robust app with so many security features, just to protect your phone. Download the app to protect your valuable device from burglars!